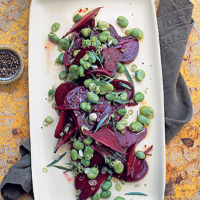 This colourful salad is brought alive by the red wine vinegar and tarragon, which bring out the flavour of the beetroot and contrast with its sweetness. Boil the beetroot in a pan of salted water for 20–30 minutes, depending on their size, until tender. While still warm, drain and peel them under running water. Set aside. Meanwhile, boil the broad beans for 3–4 minutes in unsalted water until tender; drain and refresh them under cold water, then drain once more. Peel at least half the broad beans – particularly any that are larger than your thumbnail. Mix together all the ingredients for the dressing; taste and season. Slice the beetroot in half, then cut each half into thin wedges about ½cm thick; place the wedges in a mixing bowl. Pour over the dressing, season and toss. Now add the broad beans, salad onions and half the tarragon and toss again. Transfer to a serving dish and scatter with the remaining tarragon.